This post is courtesy of our contributor Chantelle…The countdown to Christmas is upon us and before we know it we will be surrounded by cookies, candy canes and other chocolate treats. Amongst all these sugary goodies, it is important to offer some healthy options for both our kids and ourselves. 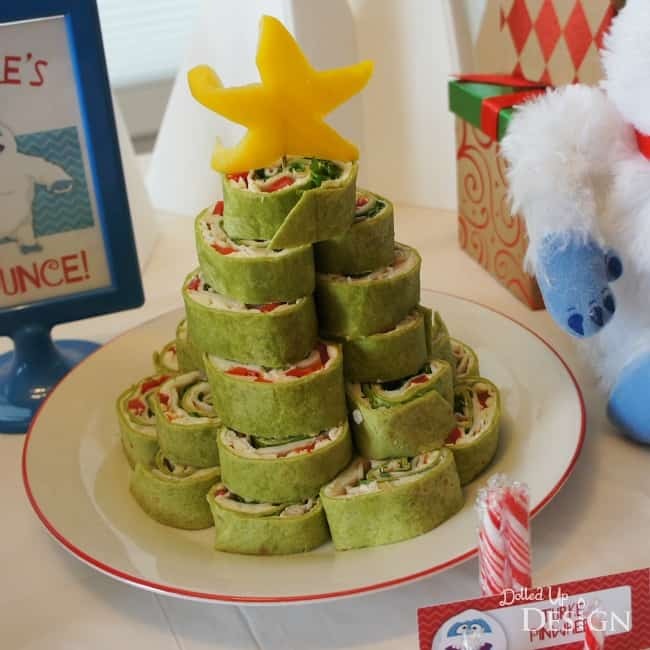 Whether it be for a school party, a playdate, or a family gathering, here are some healthier options I have come up with that will still look fun and festive on a holiday party table. Pinwheels are such a great finger food for kids. They can be made with a wide variety of fillings and I love that they are something that can be prepared in advance. For these festive themed pinwheels, I spread out a layer of ranch flavored cream cheese onto a spinach flavoured tortilla shell and layered Havarti cheese, sliced turkey breast, finely diced red pepper and green leaf lettuce. Once rolled, I wrapped the log shaped tortilla in plastic wrap and allowed it to set in the fridge overnight. To create my tree, I sliced my “logs” into pinwheels and stacked them neatly on a small plate. The star shining from the top of my tree was simply cut from a yellow pepper. Alternatively, you could skip the stacking and place the pinwheels out in a triangle on a large platter to create the tree shape with the same pepper star on top. Get the kids to eat their veggies with this fun and festive vegetable wreath. 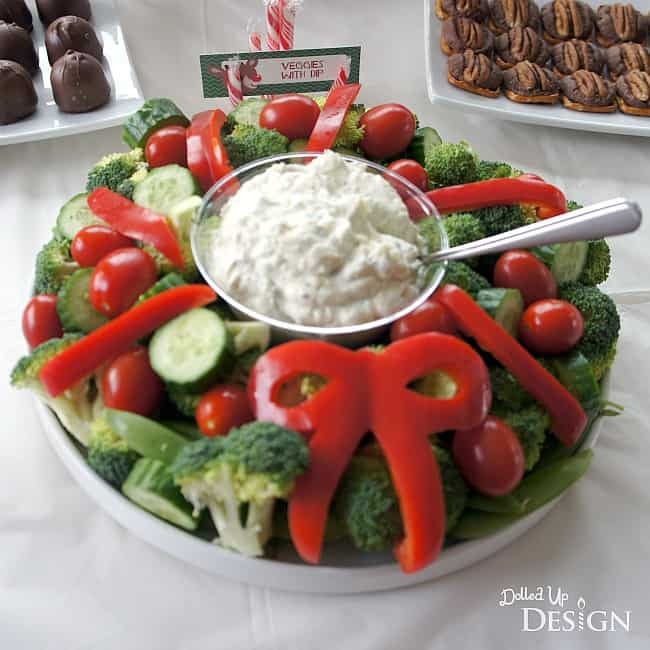 Using a round platter, put a bowl of dip in the middle and then build up the wreath shape around it with an assortment of green colored vegetables such as broccoli, cucumber, snap peas and celery. Cherry tomatoes and red pepper strips provide festive red accents, while a bow carved from a red pepper accents the finished wreath. 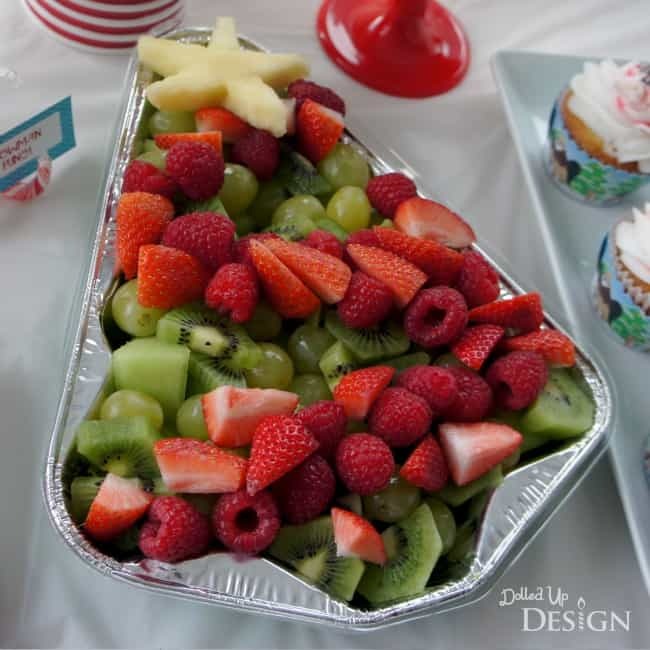 Adding a festive touch to a fruit platter is easy thanks to the tree shaped foil pans I found from the dollar store. To create my tree, I filled the pan with green fruits including grapes, honeydew melon and kiwi fruit. Red raspberries and strawberries were draped in lines across the tree to create garland and the finishing touch was a nice yellow star cut from pineapple. Babybel cheese is another of my party food favorites because most kids seem to enjoy it and it is easy to dress up the outer wax shell with paper accents. 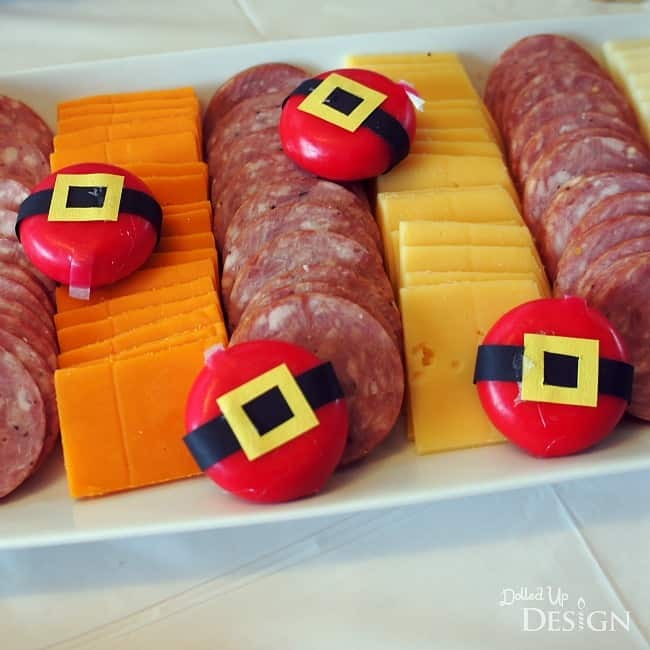 For my Santa suit Babybel’s, I wrapped thin black strips of construction paper around each cheese wheel and glued on a yellow rectangular belt buckle. It was a bit of work cutting and gluing, but the final result looked great with the platter of sliced cheese and meat. These cute little snacks make it easy to enjoy a touch sweetness without too much guilt. This sweet treat is also only three ingredients and couldn’t be any easier to make. Lay square shaped pretzels out in a flat layer on a cookie sheet and place an unwrapped Rolo candy on each one.Place into a 200 degree Celsius oven for 5 minutes until the chocolates are warmed and glossy, and then place a pecan half carefully into the center of each chocolate. 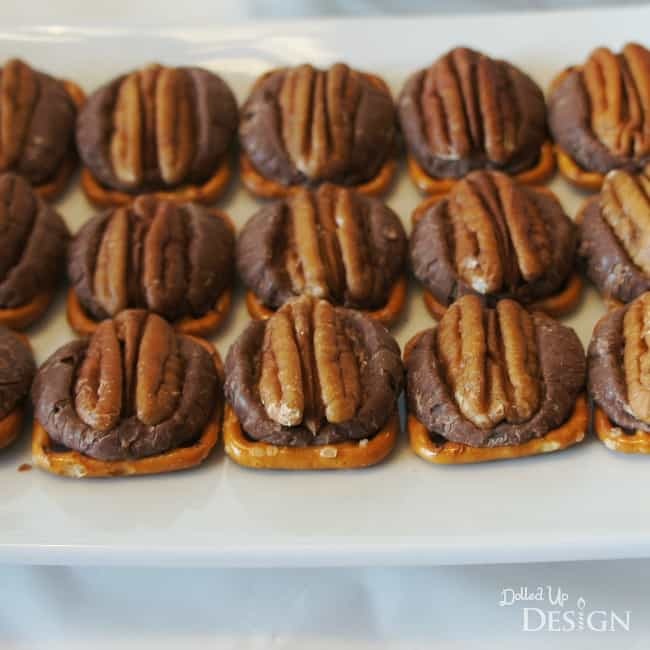 The pecan halves look like little reindeer hooves and the combination of pecan, chocolate, caramel and salty pretzels is delicious. These would also make great last minute gifts wrapped up in a cellophane bag or a nice addition to a holiday cookie tray. We’d like to send a big THANK YOU to Chantelle for sharing these delicious & cute ideas with us. I love how her ideas are always so clever yet still easy enough to recreate at home for your own party! Be sure to follow her on Facebook to stay updated on all her fabulous ideas. Loving Chantelle’s ideas? We do too! 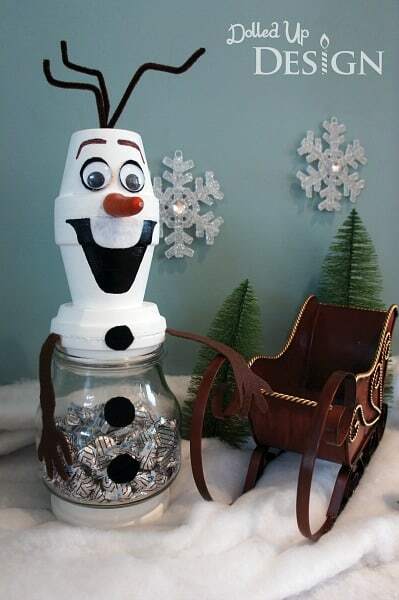 Check out this Olaf treat jar that would be perfect for your holiday party table! 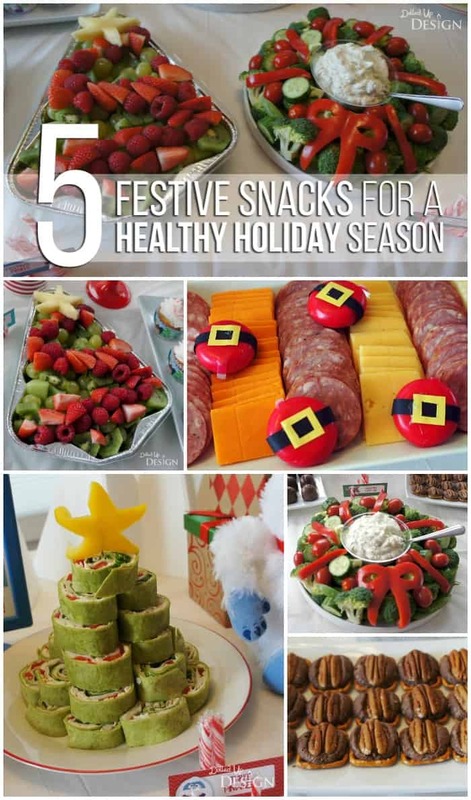 Thank you for this post you have some creative ideas for adding healthier options for your guests. Well…if there’s anything we need over the Holidays, it’s a few Healthy ideas. 🙂 These are great…I love the Santa baybel cheeses. Cute! I especially like the Turkey Pinwheel Tree. Thanks. Thank you so much for your ideas – creative, healthy and attractive! I have to play a classroom party and want it to be fun but not have to deal with the repercussions of a 25 kids on a sugar-high. These ideas should give me a nice balance – thanks! Thank you for popping by, Angela! I hope you have a great classroom party!